Esquire Bank is AAJ's "Bank of Choice"
In January 2010, Esquire Bank announced the execution of an exclusive agreement with the American Association for Justice (AAJ), which names Esquire Bank as AAJ's "Bank of Choice." Esquire Bank is Pleased to be the Exclusive Sponsor of the 2011 AAJ Annual Convention Preview in Trial Magazine's June Issue. Click here to preview the 2011 AAJ Convention in Trial. Members are given extra special treatment and will be assigned a personal private banker. Members have access to business products and services at pricing exclusive to AAJ members. You will also have access to co-branding marketing opportunities. Enjoy a classic "private bank" experience. Members are treated like valued clients rather than customers—a practice long forgotten by "too big to fail" banks. Members can feel comfortable dealing with a bank that does not support tort reform. Rather, Esquire Bank interests are directly aligned with law professional interests both politically and business-ise. Capitalize on Esquire Bank's aim to be a fee-free bank. Our ultimate goal is to eliminate the monthly fees that pick away at your capital—another practice contrary to today's "too big to fail" banks. Included in this mission is our commitment to reimburse all ATM fees incurred when using any ATM in the nation. Engage with a bank that has a complete understanding of the unique needs and pressures that law professionals face. Esquire Bank's attorney related products and services are laser-focused on members' business requirements. 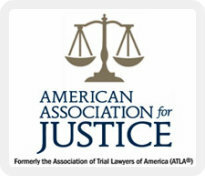 As the world's largest trial bar, American Association for Justice (AAJ) promotes justice and fairness for injured persons, safeguards victims' rights—particularly the right to trial by jury—and strengthens the civil justice system through education and disclosure of information critical to public health and safety. With over 30,000 members, AAJ provides lawyers with the information and professional assistance needed to serve clients successfully and protect the democratic values inherent in the civil justice system.